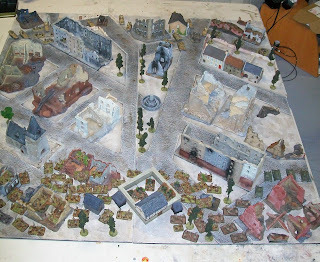 Played a 1000pt city battle with Ripsey over the weekend. - 29 Team Infantry Co.
- 20 Team Infantry Co. Deployment: Soviet Co. with 2 platoons on left bottom. AT guns in the middle surrounded by 29 stand Co. Sappers with 2iC and Bat Kom on second objective bottom right near T-70s. 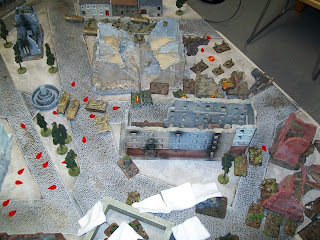 Germans - dismounted GPPGren on my left behind large ruin apt. block. 2nd GPPGren in the two middle buildings behind the ruined church (Center Top). 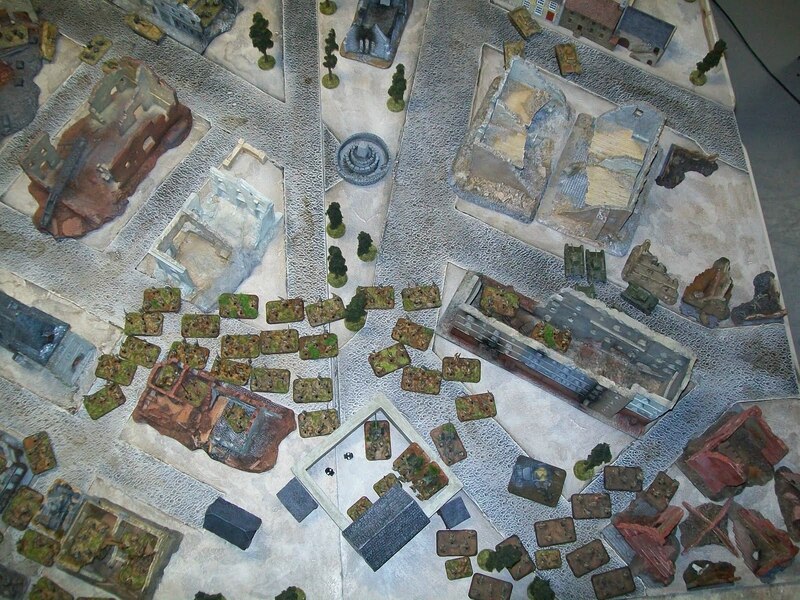 Panzers and then the Nebs top right on a side street. 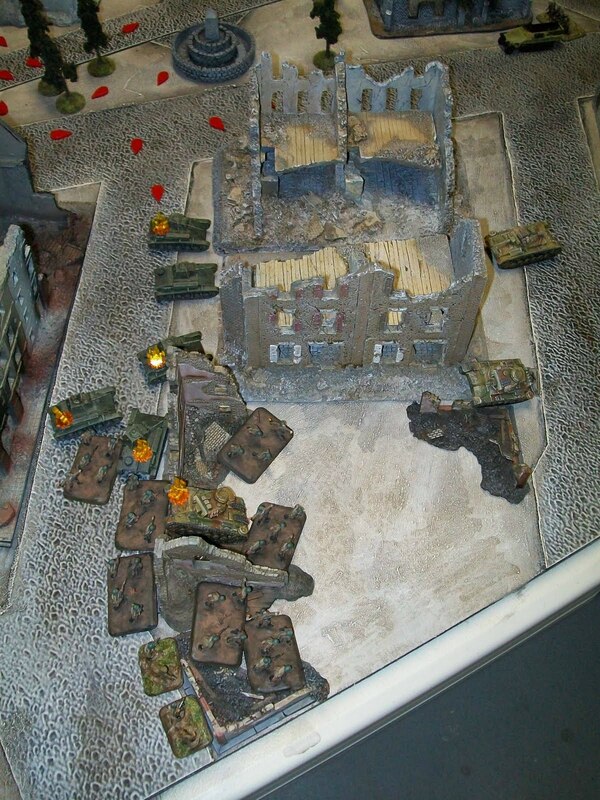 Top of 1: One Gepanzertepanzer Gren platoon moves up on my left. And the Panzer IIIs move up on the right. 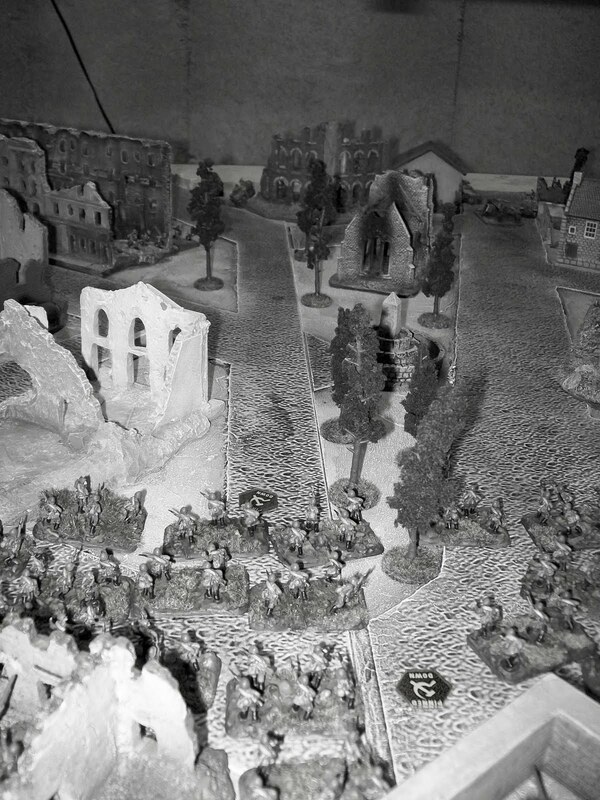 Nebs kill 2 AT guns and pin large infantry platoon and guns. Panzers 'hiding' on a side street. View from the end of the street. 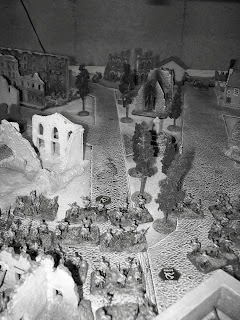 Bottom of 1: Soviet horde moves through the center of town. T-70s move up right flank. Top of 2: Germans continue to advance on my left flank. Nebs hit horde. 9 hits no casualties. GPPGrens take a few shots too. Tanks reposition on side street and bail a T-70. 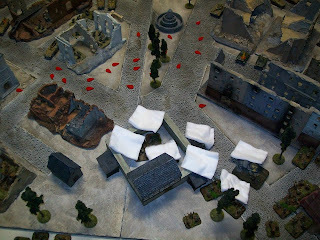 Top of 3: Germans (now that the Grens are in position) unloaded a bucket full of MG fire and Nebs on the Soviet horde and pin them. Bottom of 3: Three 1s later and one dead Komissar - the horde is boned. T-70s do nothing with their shots. Bottom of 4: Soviet horde unpins after failing a fourth straight test (1iC is there) and book it back to my deployment zone. Remaining T-70 fires back. Top of 5: Panzers move through the ruins into assault range of my sappers. Everything but the Nebs moves forward. 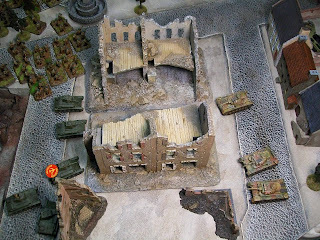 Bottom of 5: Sappers assault and capture one Panzer. 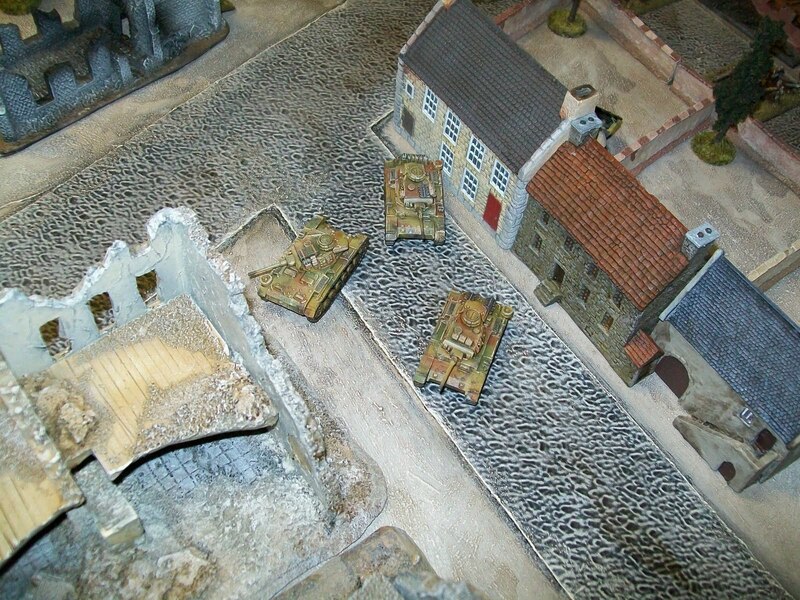 AT guns kills one Halftrack on left flank. 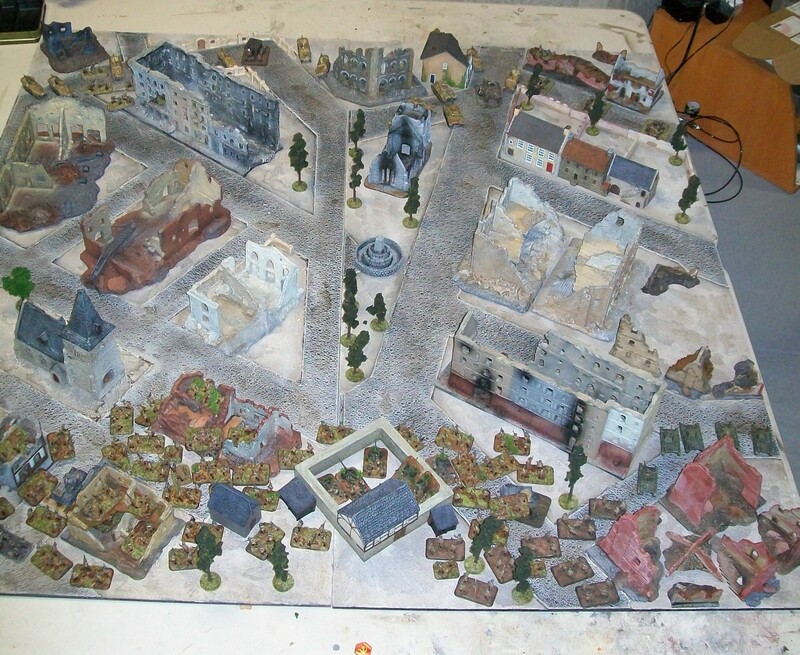 Top of 6: German Grens advance on Sappers. Nebs smoke AT guns for free movement down the middle. Grens on left flank are getting close to Co. with 2 platoons. Bottom of 6: Sappers sit tight in the ruins waiting for their next opportunity. 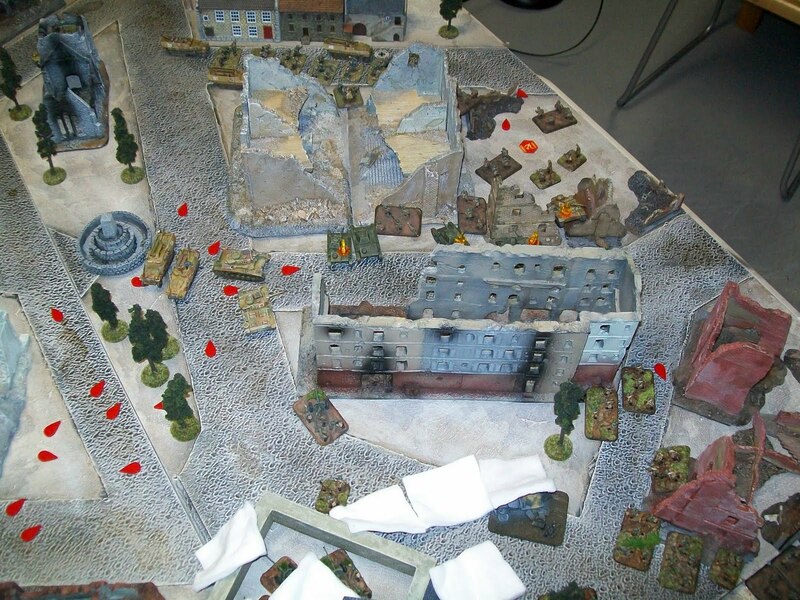 Top of 7: Nebs smoke again, Panzers and left flank Grens move towards Soviet lines. Panzers fail to kill last T-70. 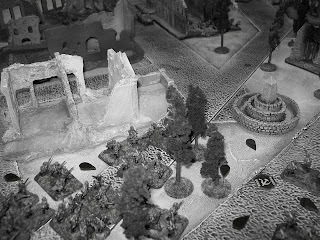 Bottom of 7: Sappers and lone T-70 fail to pin Grens and are pinned in defensive fire. 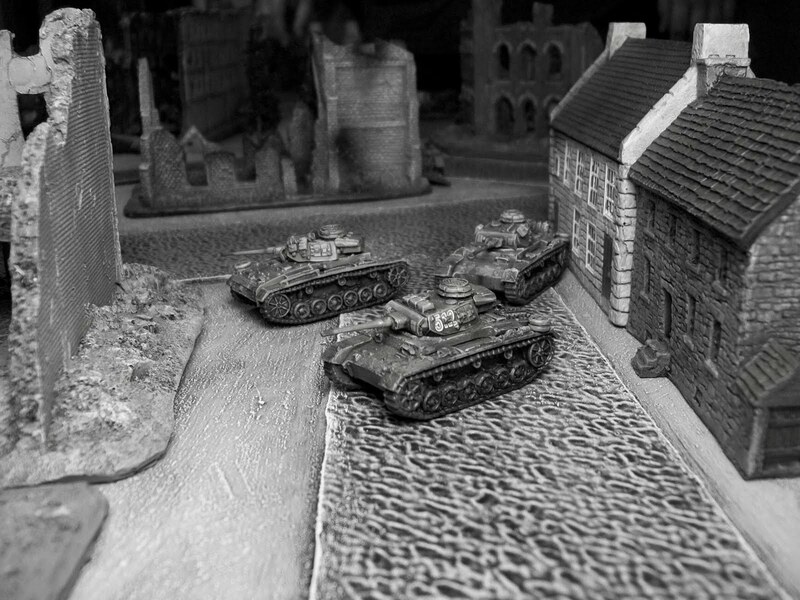 Lone At gun moves out of smoke and misses the side armour of the turned Panzer III. 2 Sapper teams succumb to Gren's MGs. Time runs out so we call it there. 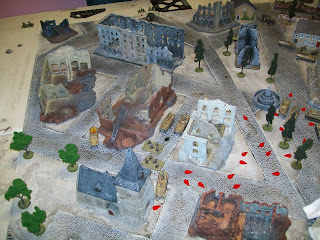 Losses for the soviets were pretty significant but not one platoon destroyed. German losses were minimal. 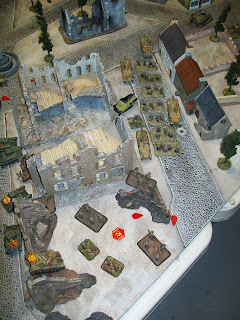 1 Panzer, 1 HT and one Gren team. One HT was bailed when time ran out. 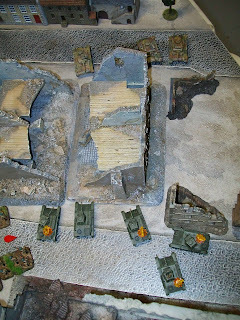 Yeah, I really should have run my tanks and 2nd platoon up your right flank. They ended up there anyways, but I could have started them earlier. 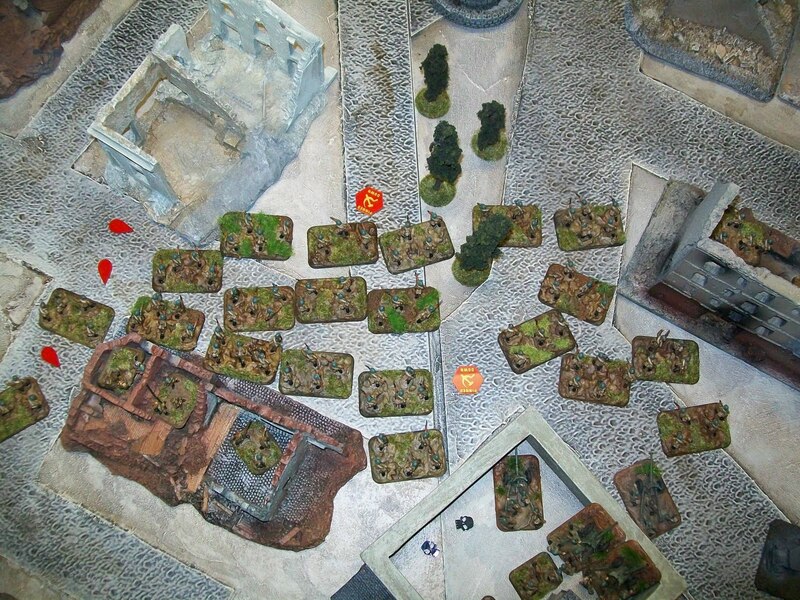 My thinking was that I wanted to leave some PzGs between the objectives to cover them. This was a great example why having three maximized Combat Platoons really is a necessity. Two to press forward, one to stick back (and possibly move to aid one of the other two once it's engaged). As much as I am loathe to paint up more infantry, I think a 3rd Platoon will do me well in 1500 pts. I've also uploaded video from the battle on my blog.